National Multi-Family Housing Insurance Survey reports that 84% of housing managers require renters insurance. AUSTIN, TEXAS, USA, April 8, 2019 /EINPresswire.com/ — GradGuard™, the leading provider of property and casualty insurance to more than 300 colleges and universities, announced today at the eleventh annual Interface Student Housing conference, that its college renters insurance program designed specifically for the needs of college students is now available to the off-campus and private housing industry through GradGuard.com/off-campus. Living away from home, whether on or off-campus, has its fair share of risk. Data from the FBI Uniform Crime Reports indicate that for 2015, there were 69,502 property crimes occurred on 684 campuses who provided their information. 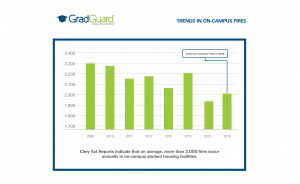 In addition, Clery Act safety reports by colleges show that for the past decade on average there were more than 2,000 fires reported within on-campus student housing. As a result, it is not surprising that the majority of state insurance commissioners recommend college students consider protection afforded by renters insurance. According to Bob Soza, President of College Parents of America, "students cannot often pay for the damages they cause or afford to replace their property that is stolen or damaged. As a result, we agree with state insurance commissioners and recommend to families to encourage their students to consider student housing properties that include renters insurance or provide a convenient opportunity for students to purchase renters insurance. For about $12/month, students can secure protection against financial losses making renters insurance a must-have amenity for college students living independently for the first time."